Deep in the jungle where the borders of Vietnam meet those of Laos and Cambodia is a region known as "the lost world." Large mammals never seen before by Western science have popped up frequently in these mountains in the last decade, including a half-goat/half-ox, a deer that barks, and a close relative of the nearly extinct Javan rhino. In an age when scientists are excited by discovering a new kind of tube worm, the thought of finding and naming a new large terrestrial mammal is astonishing, and wildlife biologists from all over the world are flocking to this dangerous region. The result is a race between preservation and destruction. Containing research gathered from famous biologists, conservationists, indigenous peoples, former POWs, ex-Viet Cong, and the first U.S. ambassador to Vietnam since the war's end, Gold Rush in the Jungle goes deep into the valleys, hills, and hollows of Vietnam to explore the research, the international trade in endangered species, the lingering effects of Agent Orange, and the effort of a handful of biologists to save the world's rarest animals. It is daybreak in Ninh Binh province, seventy- four miles southwest of Hanoi, and the limestone mountains of Cuc Phuong— Vietnam’s first national park, founded in 1962 with the blessing of Ho Chi Minh himself— are just emerging from the mist. Though it is only five a.m., lights can already be seen in the windows of the farmhouses just outside the park; the buildings’ traditional thatched roofs, combined with the adjacent neatly tilled rice paddies and abrupt nearby mountains, make the scene look as quiet and still as that on an ancient scroll. Inside the park, however, the forest is full of sound, from the drone of mosquitoes to the maniacal racket of white- crested laughingthrushes. Loudest of all is a deep- throated “huuuu-huuuuuuuhuuuuuuuuuu-huuuuuuuuuuuuuuuuu” coming from the dense treetops. This is the “great call” of the gibbon, a long- armed, fruit- eating ape, which human listeners have sometimes compared to a mourning dove’s cry, managing to be beautiful while mixed with a sense of loss. Unfortunately, it is a sound fast disappearing from Vietnam’s forests, at a pace that has accelerated noticeably over the past fifteen years. One of the few places where you can still hear what Jane Goodall once described as “one of the wonders of the primate world” is here, just inside the park boundary, at the Endangered Primate Rescue Center (EPRC). Consisting of a five- acre semiwild, enclosed area, the center’s roughly circular central compound lies inside a larger perimeter ringed by two outer fences; from above, the series of concentric circles would resemble a dartboard. 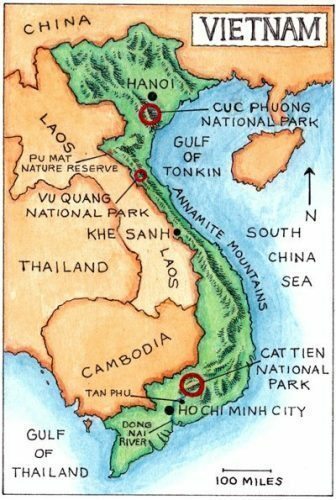 There is much to be protected, because just beyond the park lie a series of limestone mountain ridges stretching north to south to form the calciferous spine of Indochina. Known to geographers by the lovely name of the Annamese Cordillera, this mountain range runs the entire length of the country and contains within its valleys, hills, sinkholes, karsts, and innumerable caves something that Oxford University zoologist John MacKinnon described as “the lost world”— home to strange, rare animals such as the Asiatic sun bear, the Tonkin snub- nosed monkey, and the clouded leopard. But that’s not all. Since the early 1990s, many new, fantastic, large mammals never seen before by Western science have popped up here, especially in the parts where the borders of Vietnam meet those of Laos or Cambodia. Every week for the past ten years, an average of two new species of animal or plant have been found, all previously unknown to the outside world. A short list includes a half- goat/half- ox, a deer that barks, a creature that may be a missing link between domestic cattle and their wild forebears, and a close relative of the nearly extinct Javan rhino, to name but a few. Dan Drollette Jr is a writer, editor, and lecturer whose articles have appeared in such publications as Scientific American, International Wildlife, the Boston Globe, Natural History, Cosmos, Science, ABCNewsOnline, New Scientist, Newsday, and The Sciences. Recently, he earned awards from the National Association of Science Writers, the Society of Environmental Journalists, and the "East Meets West" journalism conference at UC Berkeley.